Please select a shipping method when you order the product.We will send out goods within 7 days after your payment is completed. Our products are all sent from China,so they may need a lot of time to reach you when meet extreme weather, natural disaster,strike,customs inspection,etc.You can track your goods by the tracking number. Thank you for your understanding. Notice,purchasers bear all additional costs of customs fees,brokerage fees, customs duties.These additional costs may be collected when the goods are being delivered.The custom will contact you to collect them. We will make a low declared value to help you avoid the high duties.If you want to decide the decleared value,please contact us when you place an order. Please ensure you will complete customs clearance.We will not return shipping costs for refusing to complete customs clearance. 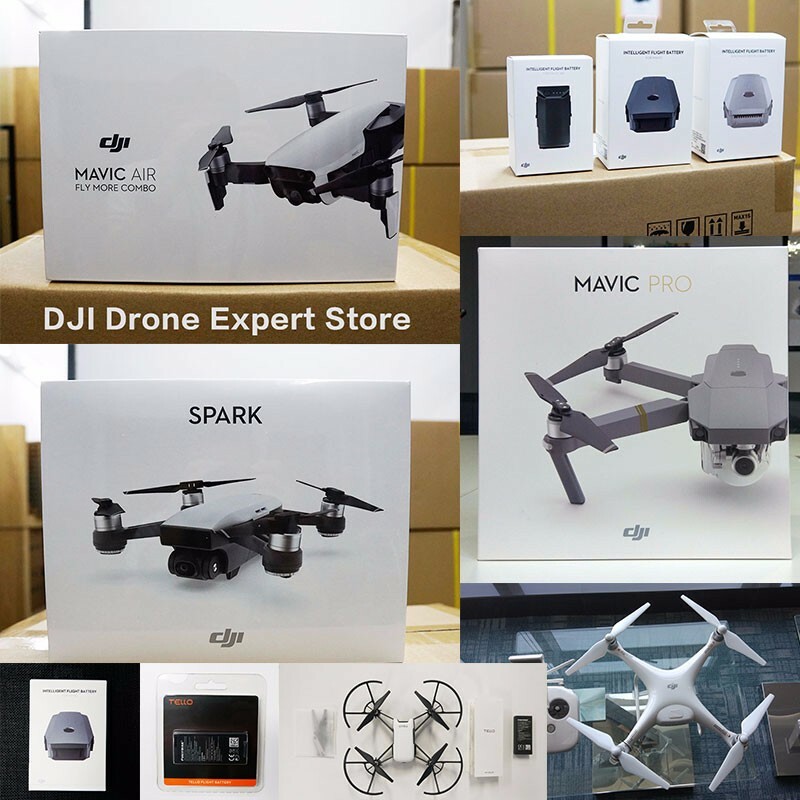 This product has 1 year warranty.When the product goes wrong, you can contact your local DJI company for after-sale-service.Or you can contact our customer service and send it to us,but we will not cover the costs of replacement parts and shipping. 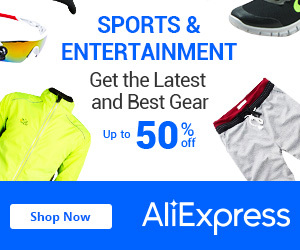 If you have any question of the product,please contact our customer service. 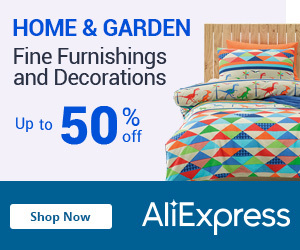 We will try our best to help you.If you feel satisfied with our product or service, please give us a 5 stars good review. If the instructions of the product do not have your language,you can download electronic instructions from the DJI Official Website . If you don’t know how to download it,please contact us. Thank you for your coming and support. How many ways are there to fly the Mavic Air and how do I change control methods? There are three ways to fly the Mavic Air. You can use the dedicated remote controller, your smartphone, or both together. 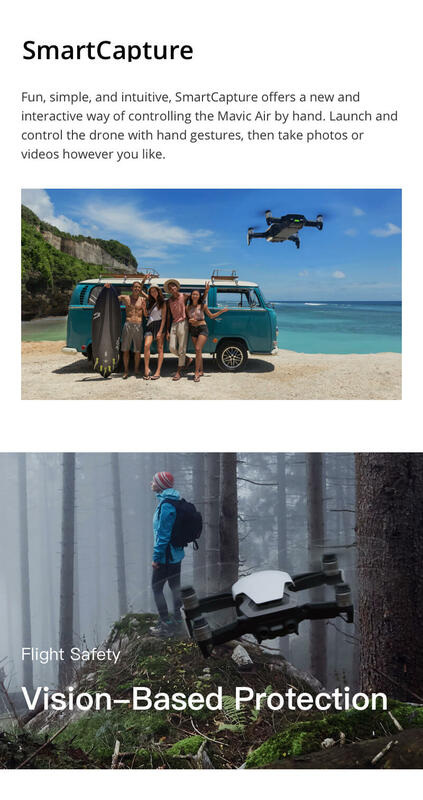 For the other two options, the Mavic Air connects to your smartphone via DJI GO 4. 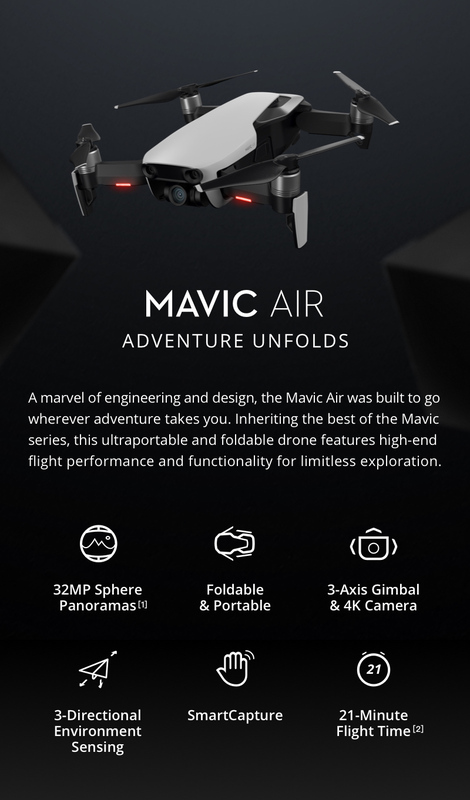 How do I activate the Mavic Air? 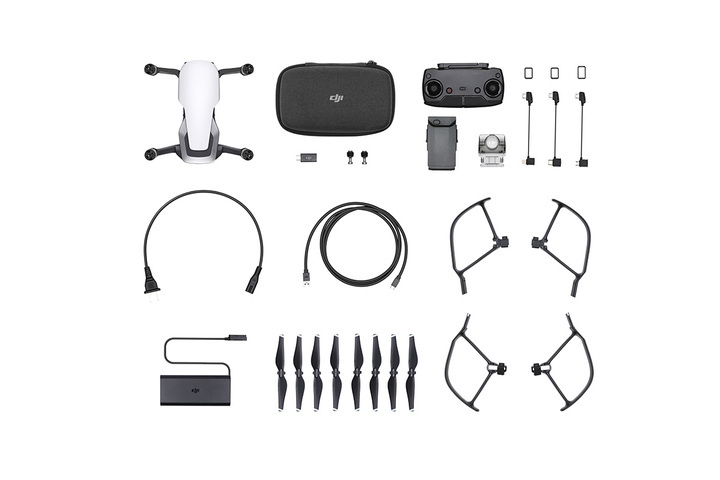 Connect the Mavic Air with your mobile device and follow the instructions in DJI GO 4 to complete activation. 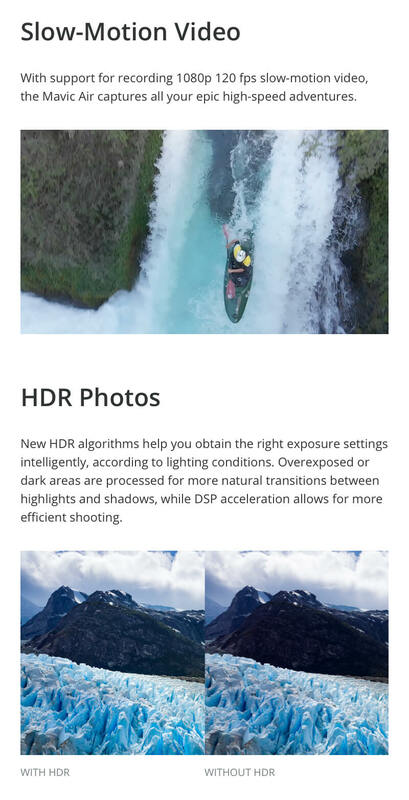 Is the Mavic Air waterproof? 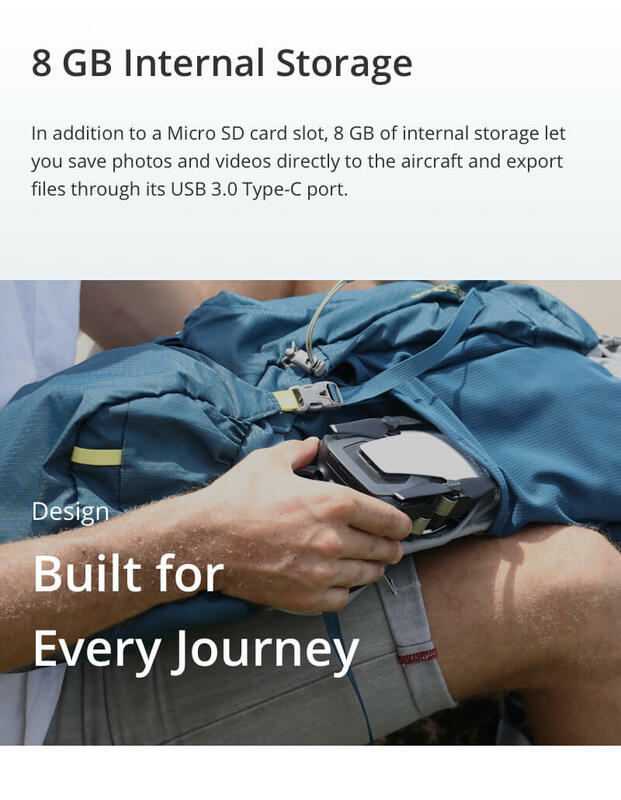 What Micro SD cards are recommended to use with the Mavic Air? Can I connect my smartphone to the remote controller using an ordinary USB cable? Yes. You can use an ordinary USB cable to connect your smartphone to the remote controller via the USB port at the bottom of the controller, but this may result in more discomfort when handling. Different cables come with the aircraft to meet your needs. 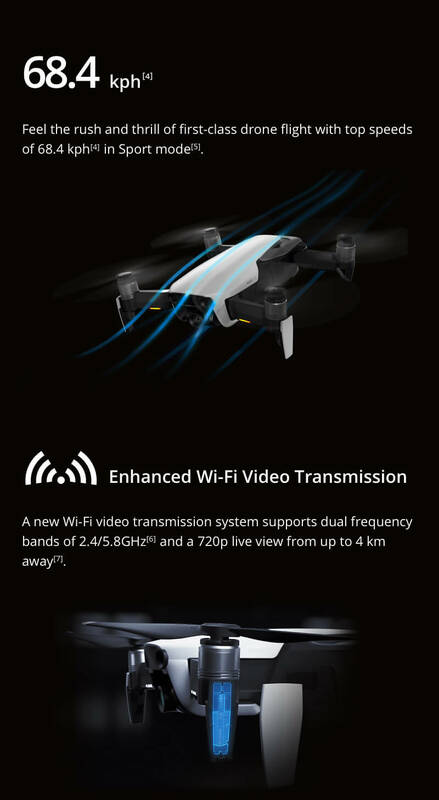 Where can I find the Mavic Air’s Wi-Fi name and password? Connect your smartphone to the aircraft’s Wi-Fi by scanning the QR code with DJI GO 4 app for first-time use. Alternatively, you can manually type in the Wi-Fi name and password. How can I change the Mavic Air’s Wi-Fi name and password? First, connect your smartphone to the aircraft via Wi-Fi. Next, enter the DJI GO 4 app and go to Wi-Fi Settings to change the Wi-Fi name and password. You can also change the Wi-Fi name and password with DJI Assistant 2 on a computer. Is it possible to connect to the Mavic Air’s Wi-Fi by using a third-party app to scan the QR code? No. You can only scan the QR code to connect to the aircraft’s Wi-Fi using DJI GO 4. Should I take the propellers off when transporting the Mavic Air? 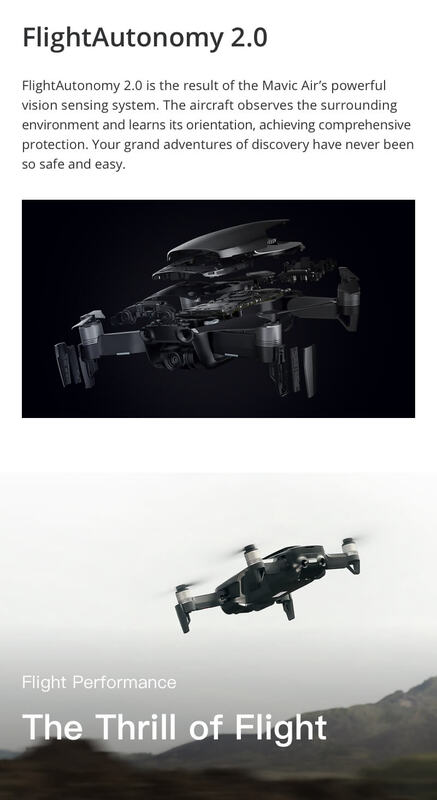 Why does the Mavic Air use non-foldable propellers? The non-foldable propellers are more streamlined, making the Mavic Air smaller and more portable when folded. What is the highest level of wind the Mavic Air can resist? The Mavic Air can withstand wind speeds up to 10 m/s. What is the Mavic Air’s max service ceiling above sea level? What is the maximum control range of the Mavic Air in SmartCapture? The control range is 6.56 – 19.68 ft (2 – 6 m). 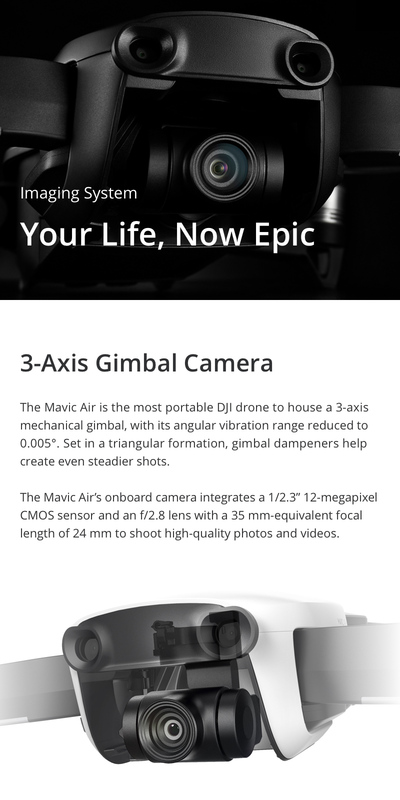 What Panorama modes does the Mavic Air support? Vertical: The camera automatically takes three vertical photos, stitching them into one panorama. Horizontal: The camera will take nine photos from different angles, stitching them into one panorama. 180°: The Mavic Air automatically rotates its body and gimbal shooting 21 pictures, stitching them together in DJI GO 4 for a breathtaking 180° panorama. Sphere: The Mavic Air automatically rotates its body and gimbal to shoot 25 photos, stitching them together for an eye-catching spherical panorama. When flying the Mavic Air close to me in SmartCapture mode, why does the aircraft remain at eye level? SmartCapture only allows the Mavic Air to fly at eye level when it’s 9.8 feet (3 meters) or less away from you. This is to ensure better flight safety and control precision. You can gesture to fly higher or lower when it’s farther away from you. Can the Mavic Air Battery Charger be used to charge the aircraft and RC at the same time? What is the Battery to Power Bank Adaptor used for? Turn on the Mavic Pro in Wi-Fi mode, press the linking button and hold for 5s. What functions does the power button perform? The power button powers on and off the battery. To do this, press it once, and then press again, holding it for at least two seconds to power on or off the battery. The power button also allows you to check the battery level. To do this, press the power button once and observe how many LEDs light up for the power level. How long does it take to charge a battery fully? It takes 55 minutes to charge a battery fully when using a standard USB charger or a Charging Hub. How often should I charge my batteries? It is recommended to charge batteries at least once every three months fully. Can I use other apps while updating DJI GO 4? No. If you do, the update will fail. You will then need to download the firmware and update again. Why does DJI GO 4 remind me to reconnect to the Mavic Air’s Wi-Fi right before it restarts to complete the update? Before the update is complete, the aircraft will need to restart. Once it does, reconnect your mobile device to the Mavic Air’s Wi-Fi. DJI GO 4 is just reminding you that you will need to do this for a successful update. Can I disconnect from the internet once the firmware is downloaded successfully? What should I do if the aircraft and battery firmware versions are inconsistent? 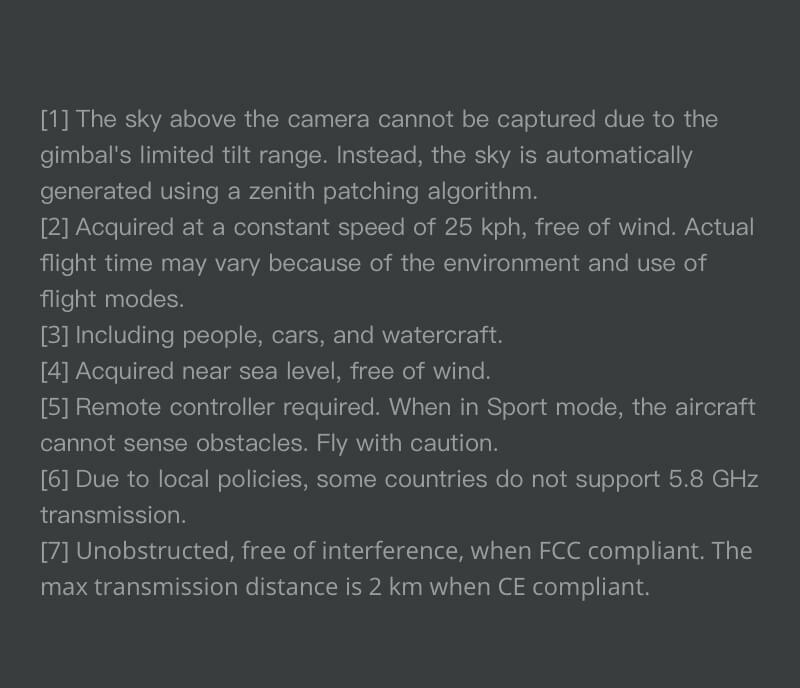 Connect the Mavic Air to DJI GO 4, and the app will inform you of appropriate updates to ensure consistency. What factors could lead to an update failure? a. Low-battery level. Make sure the battery level is higher than 50%. b. Powering off the Mavic Air or the remote controller during the update. 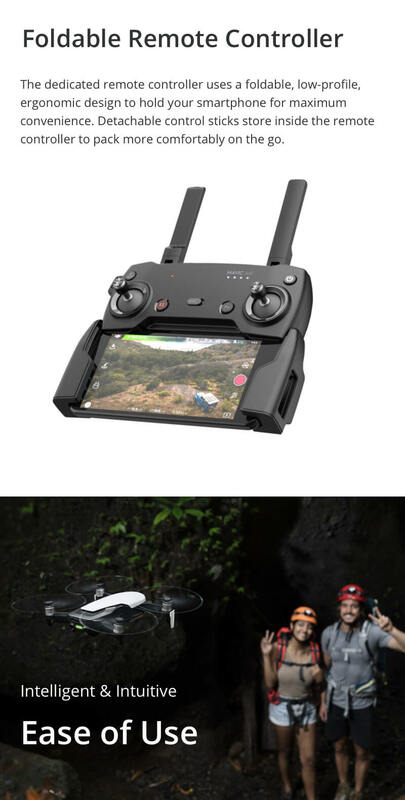 If this happens, please restart the Mavic Air and the remote controller and begin the update again. c. Internet disconnection when downloading firmware. d. If update failure persists, or the remote controller does not link with the aircraft, there may be firmware inconsistencies between devices. In this case, use DJI Assistant 2 on your computer to update your aircraft and the remote controller to the latest versions separately. 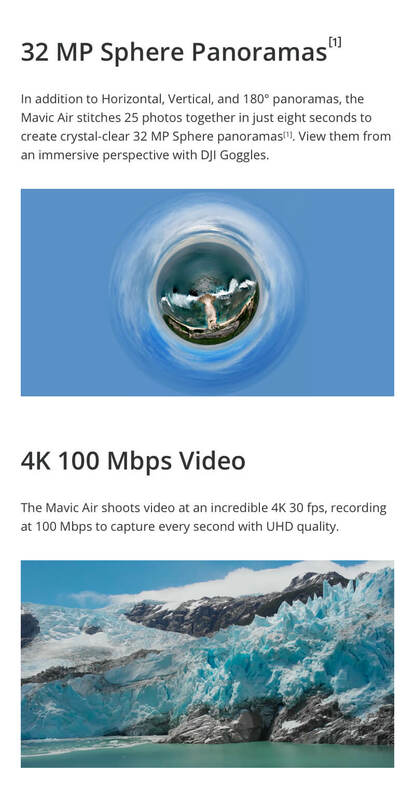 What is the Mavic Air’s video transmission range? FCC: 4000 m, CE: 2000 m, SRRC: 2000 m (unobstructed, free of interference, when FCC compliant). 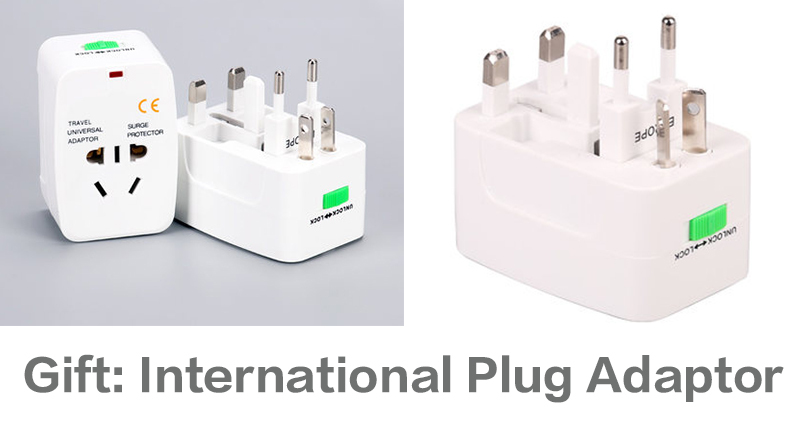 FCC: 4000 m, CE: 500 m, SRRC: 2500 m (unobstructed, free of interference, when FCC compliant). What is the resolution of the Mavic Air’s video transmission? What is the latency of the Mavic Air’s video transmission? The video transmission latency to your mobile device is 170 to 240 ms. However, this is subject to the performance of your mobile device and signal interference. Can frequency bands be manually adjusted during video transmission? 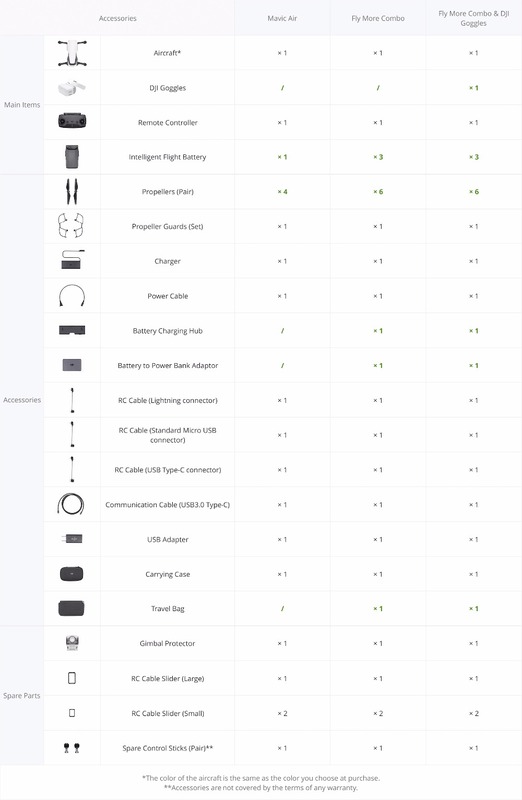 DJI GO 4 chooses a frequency band automatically by default, but users can manually select between 2.4 GHz and 5.8 GHz frequencies, according to actual needs.